Hidden in the middle of the Italian Alps not far from the Swiss border is the lush Valchiavenna valley where a tradition o f hearty food is the perfect antidote to a long day of outside activity. Chiavenna, the main town on an ancient north-south trade route, is riddled with numerous natural caves and underground passages formed millions of years ago after earthquakes and landslides brought tons of large boulders crashing down. A consistent stream of air at 48°F wafts through the caves, making them ideal natural larders which have been used for thousands of years to store meat, cheese and wine. Restaurants have been added to many of these caves (crotti) where locals and visitors alike gather to share a glass of Valchiavenna wine and sample the traditional food of the mountains. Crotto Ombra Restaurant is one such cave restaurant. Its name comes from the shadow (ombra) of a gigantic boulder sitting atop the cave. Inside, a 160-foot-long passageway lined with wooden shelves is home to almost 5,000 giant yellow wheels of the famous local Bitto cheese. The chilly air is pungent with the aroma of aging cheese. 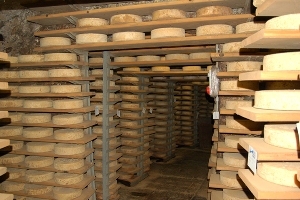 Although most of these cheeses are aged for only about 70 days, others can sit in silence for up to 10 years. Friendly, smiling waiters welcome you to a wood-paneled dining room where bright yellow tablecloths add to the cheery mood. There is a large patio with picnic tables and benches for outdoor dining. The menu is simple, featuring Bresaola (beef rubbed with spices and air-cured in the Valtellina), Pizzocheri (local buckwheat pasta), polenta, venison ragú, pork, and gnocchi. The wine list focuses predominantly on products of the area — Grumello, Sassella, and the house wine (called Chiavennasca by the locals) — although other Italian wines are also available. Try the bresaola as an appetizer. It is served sliced paper-thin, the dark-red meat drizzled with extra virgin green olive oil and a spritz of lemon juice. A sliver of Parmesan cheese graces the top. The meat is moist and delicate, the flavors enhanced by the Parmesan cheese. The regional dish of the Valtellina is Pizzocheri alla Valtellinese, a plate of dark buckwheat flour pasta served with butter, chunks of potato, cabbage, and local soft cheese melted into the steaming pasta. Although some would argue that this dish is best suited for the winter, it tastes delicious in any season after a strenuous hike. The venison ragú, stewed in red wine and flavored with aromatic herbs, arrives atop a plate of sage-flavored steaming yellow polenta. The rich flavors of the meat are offset by the simplicity of the polenta, making this a truly soul-satisfying dish. If you are still hungry, try the Crotto Ombra Bitto cheese, served with fruit. The slices of rich, nutty, tangy cheese come straight from the cave. Finally, end the meal with a bowl of fresh wild mountain strawberries and blueberries or a bowl of homemade gelato and a cup of steaming espresso. After such a satisfying repast, a stroll through the ancient 16th century town along the River Mera will help you digest as you marvel at the natural beauty of the surrounding mountains. Fly to Milan and rent a car at the airport. Several U.S. carriers have direct flights to Milan from the U.S. Most major car rental companies are represented at Milan’s Malpensa Airport. 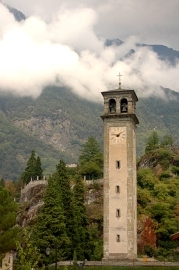 Drive north from Milan to the eastern shore of Lake Como to the SS36, which takes you all the way to Chiavenna. Crotto Ombra is on Viale Pratogiano 14 (23022 Chiavenna SO), Tel 39-0343-290133. If you wish to purchase this article for your publication, clich here to contact the author directly.